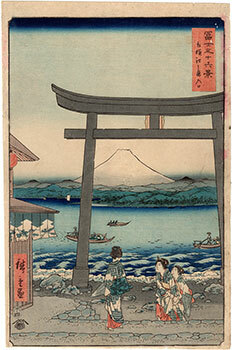 Important polychrome woodblock print of large vertical format made in April 1858 by the artist Utagawa Hiroshige (歌川広重) and depicting Mount Fuji (富士山) seen from Enoshima (江の島), the small island in the Sagami Bay (相模湾), Kanagawa Prefecture (神奈川県), in which is worshiped the goddess Benzaiten (弁財天) who, according to legend, is said to have caused it to rise from the bottom of the sea in the sixth century. Hiroshige wisely places Mt. 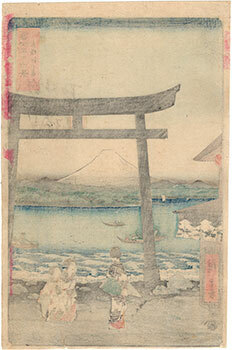 Fuji inside a torii (鳥居) gate, thus emphasizing the sacred significance of the mountain. In the lower part of the print, three women wear three identical kimonos, thereby revealing to be pilgrims. 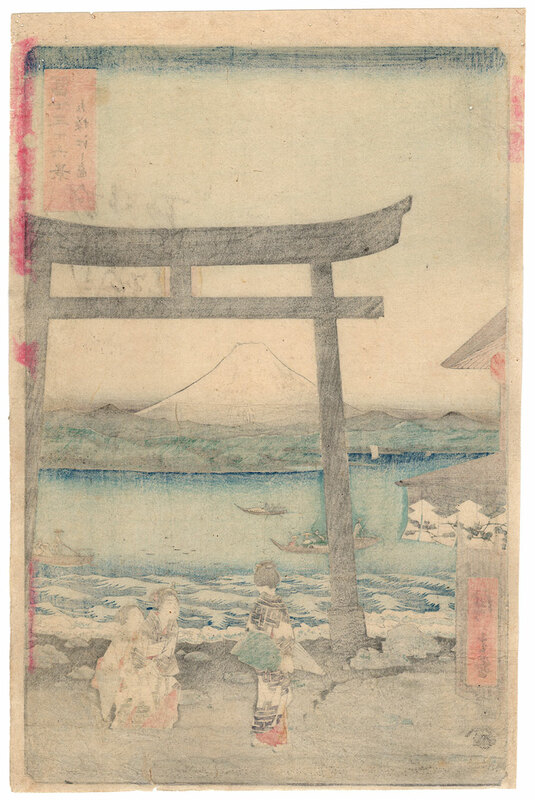 The precious print on Japanese washi paper (和紙) is entitled "The Entrance Gate at Enoshima in Sagami Province" (相模江の島入口) and is taken from the famous series "Thirty-six Views of Mount Fuji" (富士三十六景) produced by the publisher Tsutaya Kichizo (蔦屋吉蔵), owner of Koeido (紅英堂). The work, despite the right patina of time, some small holes and red halos on the margins, is in good general condition.